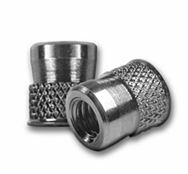 The CFW/CAW series offers a knurled body for increased spin out resistance in soft materials such as fiberglass. Increased wall thickness gives increased shear strength. Cadmium Free finish allows the CFW Series to be used in any industry, including automotive.